Object/Date: 21P/Giacobini-Zinner @ August 12,2018 02:45 UT Description: Comet 21P / Giacobini-Zinner photographed on August 12th 2018 grazing the Milky Way border in Cassiopeia more dense of stars (down). 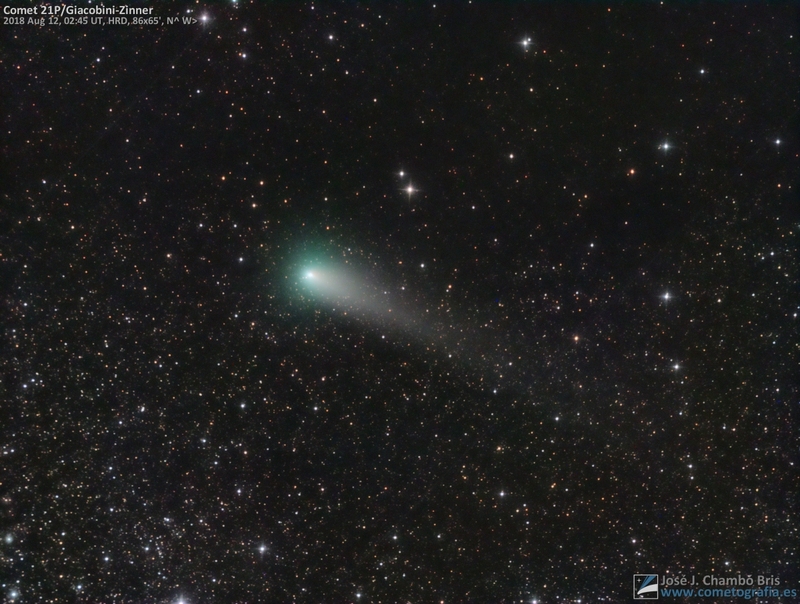 The comet has considerably increased its angular size showing a turquoise color with 9' wich wrapping nucleus. Its dust tail reaches 40' lenght inside within which can be seen a ionic jet more condensed. Acquisition: Telescope GSO 8" N f/3.8 & Camera Atik 383L+. 12 min. total exposure. From Hoya Redonda, Valencia (Spain).